The rockabilly band, all sharp suits and pomaded coifs, launched into a slow jam, which my partner, Tomo, took as an opportunity to wrap an arm around my waist and dip me backward. I caught a glimpse of myself in the mirrored wall and cringed: a twenty-something gaijin slow-dancing with a man old enough to be her father. It’s so obvious I’m a hostess, I thought to myself. Tomo was wheezing from his efforts on the dance floor, so he led me to a small table where we sat for an hour in silence. Tomo spoke no English and rebuffed my attempts at Japanese. He smiled to himself and stared ahead, silently nodding to the band on stage. Tomo and I were at Oldies on a dohan, or dinner date. I was working in Tokyo as a hostess and Tomo was my customer. A hostess is a paid companion for those who have the money and the inclination to pay someone to pour their drinks, light their cigarettes, laugh at their jokes, and applaud their karaoke efforts. If a customer takes a particular interest in a hostess, he may invite her on a dohan — as Tomo had that night. The customer pays the club a fee, takes her out for dinner with the agreement that they will return there afterward — and spend more money — and the hostess gets a bonus. In the years after Japan’s famous bubble had popped (I worked there in the mid-to-late 2000s) when expense accounts were shrinking and financial meltdown was looming, it was becoming more difficult to secure a dohan. I wasn’t very good at it in the first place, and was becoming tired of trying. This effort took the same form every afternoon, soon after I had shaken off the inevitable drinking-on-commission-induced hangover that was a staple of my life in Tokyo. I would go through my stack of business cards, then call the hostess club customers I had spent the entire previous night boring and being bored by in return, to tell them I really missed them and wouldn’t it be nice to go out for dinner tonight? And, oh! You could take me back to the hostess club after. I was terrible at it. This date with Tomo was my only dohan that week. I was a failure as a hostess. Still, I thought, at least I could count on my bonus this week. While we sat in silence I calculated the night’s earnings in my head. This dinner date would earn me the equivalent of a $50 bonus, plus my hourly club rate of $30. And then there was the $15–30 I would earn for every drink Tomo bought me — and surely I could convince him to buy me a few. We left Oldies and made our way to my club, stepping out of ‘50s-era “America” and into what, by comparison, seemed like the future. Tokyo wrapped itself around us: the neon, the giant television screens, and the clashing sound of advertisements competing against one another. Here, in the Roppongi district, properties unique to the red light areas were added to the mix. Hustlers grabbed the arms of every male passerby, making their pitch: “my club has most beautiful girls in Tokyo,” while groups of women clustered outside clubs, comparing business. My irritation subsided and I smiled at the scene I had made my home; for all its frustrations and humiliations, the mizu shobai was, for me, irresistible. I just loved Tokyo after dark. I was like a vampire, but I fed off neon rather than blood. Mizu shobai, or “water trade,” is a euphemism for the nighttime entertainment business in Japan, including hostess bars. There are several explanations for the term’s origin — the industry’s impermanence and the association of water with pleasure being just two. The watery allusion suited my experience; I only meant to get my feet wet, but the deeper I got the more it felt like drowning. I traveled through the water trade as if it in itself were another country. 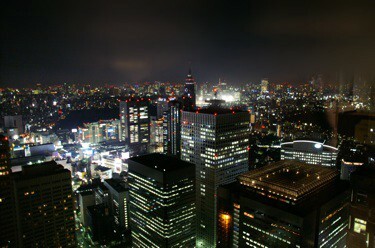 For me, the Tokyo night was something to be explored and mapped, like its own world. I struggled with its euphemisms as much as the language, wrangling with the strange, coded business names — like Soapland, Delivery Health, and Image Club. I was sure, though, that no one visited Snack Bars for the food. Roppongi, I thought, was a microcosm. A multitude of different businesses occupied the same planet, but each had its own particular set of customs and culture. A Hostess club and a Fashion Health club could face each other across a narrow hallway in a skinny building, but the customs of one wouldn’t necessarily translate well in the other. As we entered the club’s elevator and pushed the button for sixth floor, Manager slipped between the doors and nudged up against Tomo, his thick leather briefcase, and me. Known by apparently no other name, Manager was in charge of the club. A former boy-band member who, hostess club gossip had it, displayed a floor-to-ceiling portrait of himself in his living room, Manager had the orangey glow of a tanning-salon regular, and had bleached blonde hair and remarkably white teeth. His moods varied wildly and were dependent upon that night’s drug intake — and he was almost impossible to impress. He sized me up, as well as the profit standing alongside me, and gave a rare smile. I was off the hook; tonight I was a good hostess. “Irrashaimasse!” Mama-san screamed in welcome as we entered the club, hustling us toward a table. As she buzzed around us, setting down Tomo’s soda and snacks, I stole a glance around the club. I noticed Jasmine, a platinum blonde Australian, with her regular, Yuki, and stifled a groan as the Filipina waitress wheeled over the karaoke machine. True to form, septuagenarian Yuki shuffled to his feet and launched into “Theme from Ghostbusters.” His signature, which the rules of business dictated we must find hilarious each and every time. “Ghostbusters,” he cried, pausing for dramatic effect. “Ghostbusters!! !” he screamed even louder, looking around to be sure he had our attention. I called one of my friends over to sit with Tomo and me. This act was known in hostess club vernacular as a request. Tomo had to pay an extra $30 for requesting my friend Carla to sit beside him and drink whatever he would buy her. Technically, however, it was me who asked him to invite Carla; she hadn’t had a dohan this week and I hoped that the $30 request bonus and drink commission would help her out. My friends and I helped one another like this: by inviting one another to sit with our customers and even, if we could convince the customers to pay double, to come out on dohans together. Even with Carla at the table, Tomo kept silent, so we talked between ourselves, with Tomo occasionally giving a nod of thanks as we topped up his glass. Our night inched on, but, being paid for every drink he bought us, we drank glass after glass, gradually disengaging Tomo and then ignoring him until he left. Around 2 a.m. Carla and I stumbled out of the elevator, drunk. Usually at this point we would head out into the streets to do drink back. Drink back was the name of a system that supplemented our club earnings by earning us commissions for drinks bought by any customer we could drag off the street and into one of the ‘normal’ bars along Roppongi’s main strip. If you could convince, say, an employee of one of the international investment banks whose offices were nearby to buy you a bottle of vintage Dom Perignon, you could make an extra $200–500. Just for one bottle. More, for viticultural reasons I never grasped, if it was rosé. But I wasn’t interested that night. I only wanted sleep, so we hugged goodbye and went our separate ways. Alone, I stepped into a hard, bright Roppongi. For most of the hustlers on the street, the night was only beginning, but I was so tired that Roppongi’s bright neon seemed to have dimmed a little. When I look back at my time there, I point to this night as the moment I made an unconscious decision to leave. By the time I finally left, I had been working in the mizu shobai for more than a year. I had been doing the work because it paid extraordinarily well and I wanted to save up money. But I kept blowing my savings on the long vacations I had to take every three months to detox. The drinking and partying, which used to been a fun perk of the job, had revealed themselves to be, in fact, its core. I felt constantly drained from the effort it took to push through daily hangovers and to play the part of fun party girl every night. I pushed through the crowds and left the mizu shobai behind me. Soon I would leave Tokyo on another trip to Thailand. But that time I didn’t return. Karen Gardiner Dion is a Scottish writer who lives in the U.S. and still misses Japan. She blogs at The Six Tree.